I first came across this recipe in a copy of the 1932 Woodward and Lothrop Cookbook and Kitchen Guide for the Busy Woman in the library of Sandy Spring Museum in Sandy Spring, Maryland, where I was doing fieldwork at the time. The cookbook, written by Mabel Claire, was of local publication, as Woodward and Lathrop was a Washington, D.C. department store, first opening in 1887. The implication of the subtitle, according to author of The American History Cookbook Mark Zanger, was that these recipes were for the woman who worked outside of the home, kept no garden, nor had much stockpiled in the way of stored, preserved food. She was likely a city-dweller, and was also living in the midst of the Great Depression. Hence, this collection offers recipes that are generally quick and thrifty, calling for a modest number of ingredients and none too fancy. The cookbook does make up for this frugality by offering innovative recipes, as evidenced in the lemon-chocolate pairing in this Black Bottom Lemon Pie. The classic Black Bottom Pie features a chocolate bottom layer, covered with vanilla custard, and sometimes topped with whipped cream. This version is said to have originated in southern California, first appearing in print in the 1928 Los Angeles Times. I couldn't find much about the origins of Black Bottom Pie with a lemon layer, but four years later, Mabel Claire included it in her cookbook, calling it a "New taste thrill-- chocolate in lemon meringue pie. It's a gourmet treat." 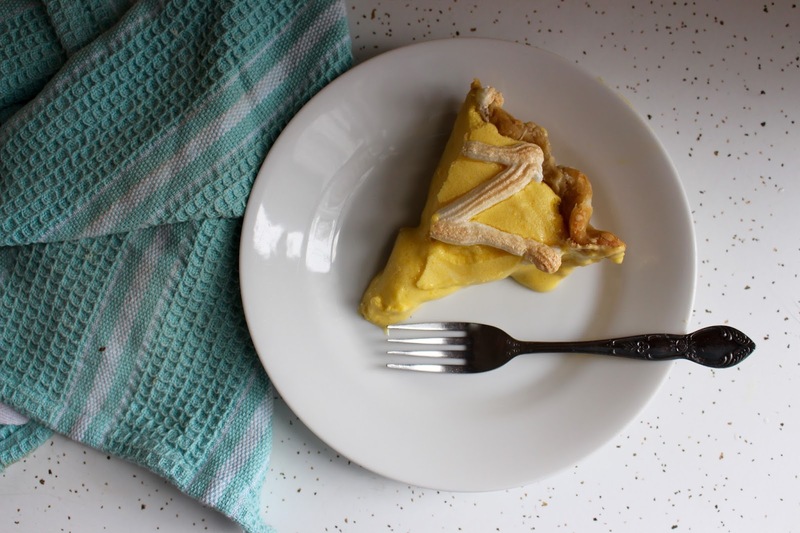 Today, the pie has been popularized by Emily and Melissa Elsen of 4 and 20 Blackbirds, who offer it in their Brooklyn shop and include a recipe in their cookbook. 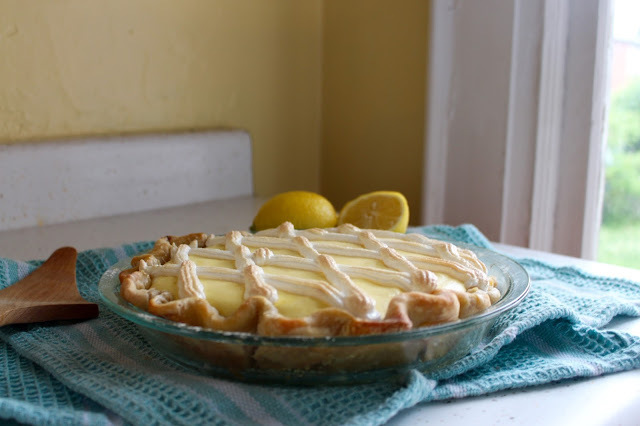 Here, I stuck closely to Claire's version, adding some cornstarch to thicken the yellow custard, and including more specific directions-- particularly for blind baking and refrigeration (the original did not call for it). What I certainly kept, and what may be the most ingenious part of the recipe is the lattice meringue, a style I've never found elsewhere. 2. Remove crust from freezer, line with parchment paper and fill with pie weights or dried beans. Blind bake crust for 20 minutes. After 20 minutes, remove paper and weights and brush with egg wash. Return crust to oven and bake for 5-8 more minutes more or until fully baked, puffed, and golden brown. Let cool while you prepare the filling. 1. Melt chocolate over hot water in the top of a double boiler. Spread evenly over the bottom of the baked and cooled pie shell and set aside. 2. In the top of a double boiler, beat egg yolks until thick. Add lemon juice and water, mixing well to combine. Stir in lemon peel, 1/2 cup of sugar, and cornstarch. Cook over hot (not boiling) water, stirring constantly until thick, about 15 minutes. Remove from water and heat and let cool. 3. Preheat oven to 325 degrees F. In a stand mixer fitted with the whisk attachment, beat egg whites until frothy. Add remaining 1/2 cup sugar gradually, beating constantly until stiff glossy peaks form. 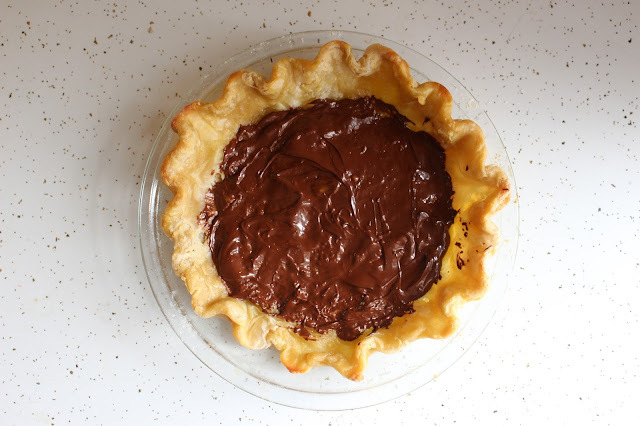 Fold half of the egg white mixture into the egg yolk mixture until combined and pour over chocolate bottom in pie shell. 4. 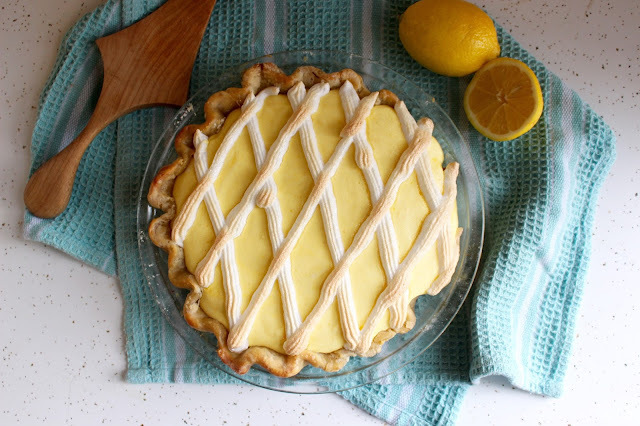 Spoon remaining egg white mixture into pastry tube and make a lattice design on top of the lemon filling. 5. Bake in oven for 10-15 minutes or until meringue is lightly browned. Let cool to room temperature and chill in refrigerator at least 1 hour before serving. Enjoy!